A-HOTEL.com - Luxury and cheap accommodation in Oben, Russia. Prices and hotel, apartment booking in Oben and surrounding. Armkhi Hotel features a seasonal outdoor swimming pool, garden, a terrace and shared lounge in Armkhi. Featuring a 24-hour front desk, this property also provides guests with a restaurant. Guest House Gornaya Saniba in Staraya Saniba features barbecue facilities and a garden. Among the various facilities of this property are a terrace and a shared lounge. Featuring free WiFi, Camp at Kuro offers pet-friendly accommodation in Kazbegi. Gudauri is 25 km away. Riverside Kazbegi in Stepantsminda features a garden and a terrace. Free WiFi is provided. Situated in Stepantsminda, Mikheil Pitskhelauri Guest House features a garden, a terrace and a shared lounge. The accommodation provides free WiFi. Situated in Stepantsminda, Giorgi's Guest House features a shared lounge. Free WiFi is at guests' disposal. Offering free WiFi and a garden, Kazbegi Hut is situated in Kazbegi, 40 km from Gudauri. Vladikavkaz is 40 km from the property. Mari Qushashvili Guest House is located in Kazbegi, a 10-minute walk from Spephantsminda Museum. Free WiFi access is available. Kazbegi Inn features rooms in Stepantsminda. Among the various facilities of this property are barbecue facilities, a garden and a shared lounge. Kosolia is located in Stepantsminda and has a garden and a terrace. The accommodation offers free WiFi. Zura's Guesthouse is located in Stepantsminda. The accommodation provides free WiFi. Mariami is set in Stepantsminda and features a garden and a terrace. Among the various facilities are a bar and ski storage space. Set in Stepantsminda, The White House provides a garden and terrace. All rooms boast a kitchen and a shared bathroom. Featuring a garden and free WiFi, Anamaria's Guesthouse is set in Stepantsminda. All rooms boast a kitchen and a private bathroom. Featuring free WiFi, North Kazbegi is situated in Stepantsminda. Among the various facilities are a garden, a terrace, as well as a shared lounge. Offering a barbecue and terrace, Guest House Maili is located in Kazbegi, 35 km from Gudauri resort. Guests can enjoy the on-site restaurant. Mount Guest in Stepantsminda features barbecue facilities and a garden. Featuring a shared kitchen, this property also provides guests with a terrace. Offering views of Kazbegi Mountain, Marinas Guest House is located in Kazbegi. Free WiFi access is available throughout the property. Archil and Nino Gigauri offers accommodation in Kazbegi. Guests can enjoy mountain views from the shared terrace. 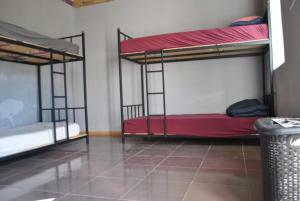 Sunny guesthouse is offering accommodation in Stepantsminda. All rooms boast a kitchenette and a private bathroom.